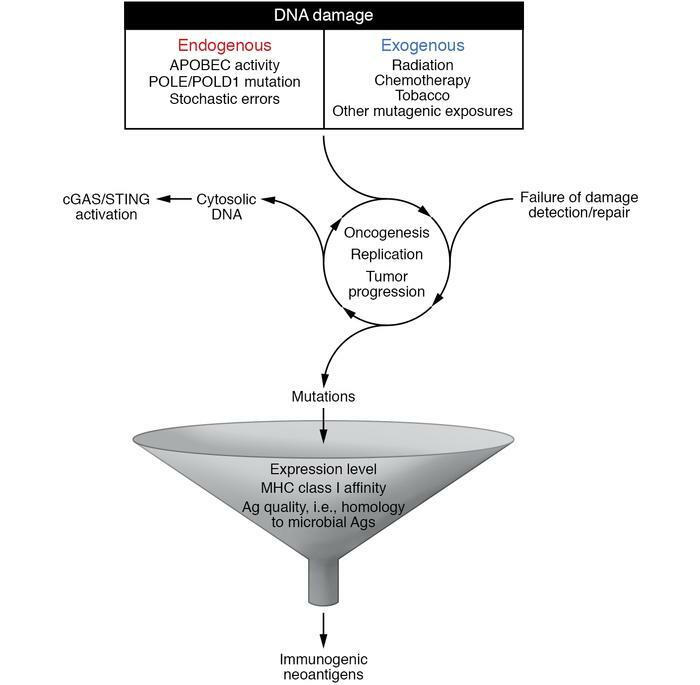 DNA damage combined with failed DNA repair is an initiating step in oncogenesis, but also contributes to ongoing tumor progression with uncontrolled replication and accumulation of genomic errors and genomic instability. Genomic instability may lead to enhanced tumor immunogenicity through (a) the accumulation of high numbers of mutations, possibly resulting in the expression of mutation-associated neoantigens, which can activate the adaptive immune response, and (b) the accumulation of cytosolic DNA, which can activate the innate immune response via the cGAS/STING pathway. Persistence/progression of these tumors thus relies on mechanisms of immune escape such as PD-(L)1. The addition of DNA-damaging therapies (e.g., chemotherapy, radiation, PARP inhibitors) may further enhance genomic instability and therefore synergize with CPIs in some tumors.